Spotted: my favourite colour combo for the spring and summertime. Pink and red traditionally don't really go together - it definitely feels like the whole black and blue combining fiasco all over again. But this has apparently been one of the upcoming trends and that's why I decided to give it a try. Sort off. I've said this so many times before, but just to do it one more time: be careful, when it comes to trends. Not everything that is IN at the moment will suit you, your style and aesthetics. Be open-minded and selective at the same time. That's the best advice I could give you. Therefore, as always, I was really picky and careful with this season's "hottest trends", so I chose a more minimalistic approach to tackle this specific trend: mixing red and pink together. I never thought I would like combining these two colours, but hey, people change their minds all the time, don't they. 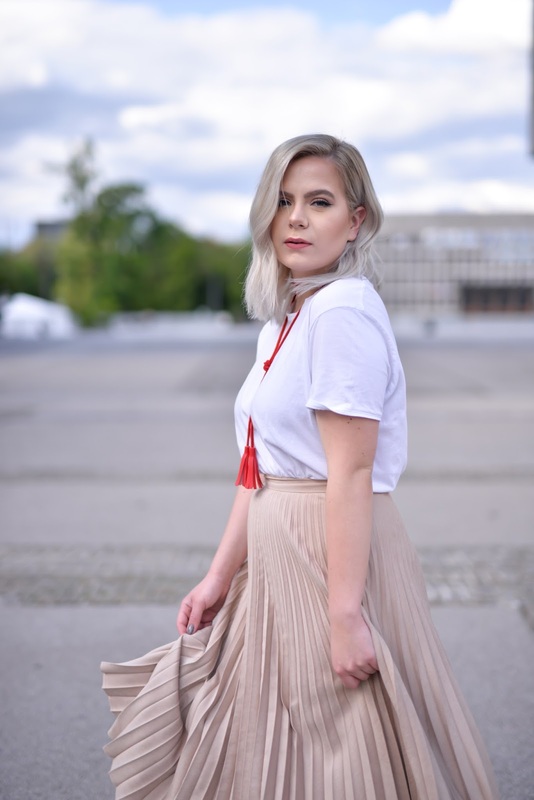 It's actually a really easy trend to style, in my opinion, because you get to choose from so many options: you can colour-block with a shirt and skirt/trousers, you can have both colours already combined in one dress, with shoes, accessories - bags especially - and so on. I opted for a safer option out of all the mentioned above and mixed a fun pleated skirt from Mango with a simple handmade choker. 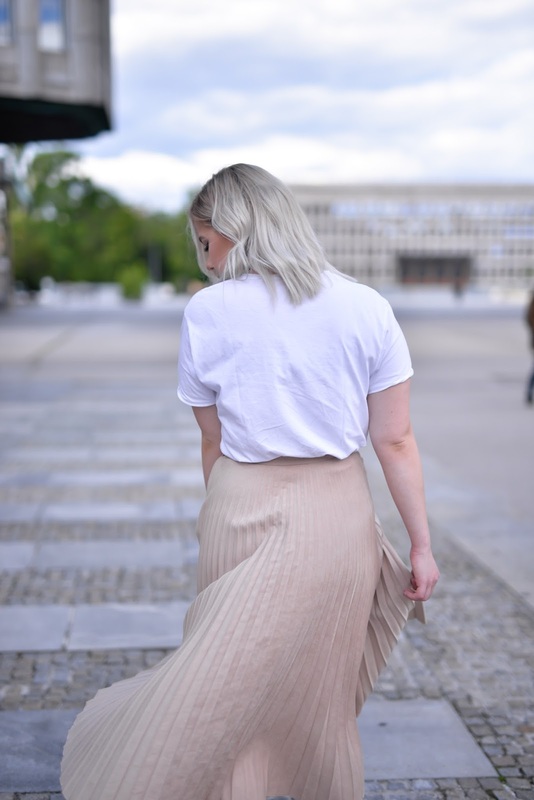 Because I don't own that many pink items in my wardrobe, I chose a flared beige/muted dusty pink skirt (it definitely looks more pink in person than it does on the photographs, I promise) from Mango, which has to be by far my "most spring item" in my closet. 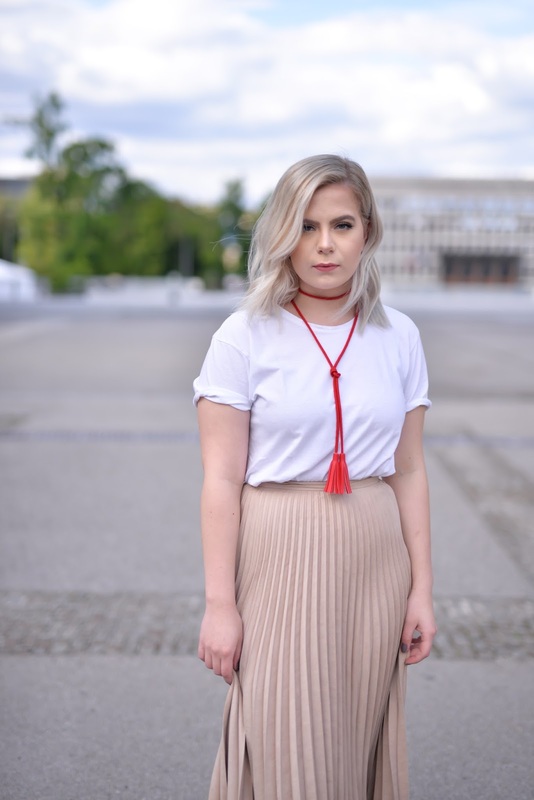 I paired the skirt with a simple white tee and red MKS tassel choker, to bring some colour back into otherwise quite basic outfit. I finished everything off with a pair of metallic slip on sandals from Mango. When it comes to minimalistic outfits, you need to pay special attention to the textures (pleat, metallic, tassels, etc. ), which bring the interesting factor out of what at first appears to be a simple (basic) outfit.